Glastonbury festival was once described to me as something magical, surreal and inspiring making you feel like no other festival has. This arts festival is the worlds largest of them all pathing the way for all the others. Worthy Farm in Somerset is an area steeped in history where King Arthur may be buried and the famous Sacred Space stone circle brings the sound of drums and hundreds of torches lit every Sunday morning. With its boundary stretching to over 8 miles and 1 and a half miles across, theres no wonder it can host over 100 stages. This year artists such as Craig David, Kaiser Chiefs, Ed Sheeran, Foo Fighters, Katy Perry and Stormzy entertain you. 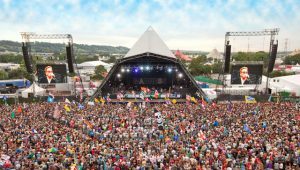 Glastonbury festival are sponsors of Greenpeace, Water Aid and Oxfam and also winners of the NME Award for Best Festival. Glastonbury Festival....where every minute brings a new spellbinding vision, captivated and cultured. However, as in recent years, the weather can turn bad turning your camping and glamping experience into a mud bath. Coachstar RV offer affordable luxury for you and your friends or family in a motorhome that accommodates up to 6 people. Although unique in design, all our fleet offer leather upholstery, full sized American fridge/freezer and cooker, sky tv, fully flushing toilet, shower, sumptuous bed linen and towels and even a gas barbeque should you wish to dine under the stars with your friends. We can have your food order delivered to us (at no extra cost) so we can have it unpacked and stored ready for your arrival so your beers and wine are chilled. Coachstar RV will deliver, set up then collect your motorhome after the event, we even clean up after you so all you have to do is enjoy your festival, glamping at its finest.